Shri N. Chandra Babu Naidu, Hon’ble Chief Minister of Andhra Pradesh and Shri Praveen Prakash, IAS, Resident Commissioner of Andhra Pradesh met senior media representatives. 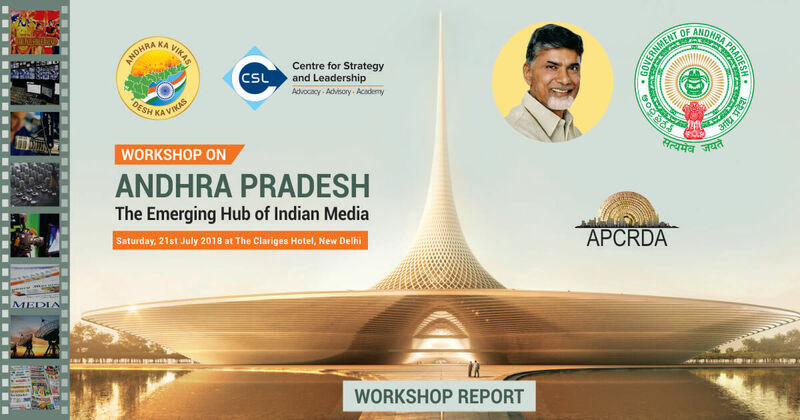 Saturday, July 21, 2018, New Delhi: Centre for Strategy and Leadership organised a workshop on "Andhra Pradesh: The Emerging Hub of Indian Media" at the Claridges Hotel, Delhi. Andhra Pradesh Chief Minister Mr N Chandrababu Naidu inaugurated the workshop, a first in the series of nine workshops titled “Andhra Ka Vikas, Desh Ka Vikas”. Dr. Anurag Batra, Chairman and Editor-in-Chief, BW Businessworld and Exchange4Media; Mr. Sandeep Marwah, Founder and Managing Director, Marwah Studios; Ms. Archana Verma, Group Vice President, Reliance ADA Group; and Mr. Vikas Sharma, Chief Executive and Director, Centre for Strategy and Leadership were the expert speakers of the day. Mr. Praveen Prakash, IAS, Resident Commissioner, Government of Andhra Pradesh, Mr V Rama Manohara Rao, Special Commissioner APCRDA, and Mr. Metta Rama Rao, OSD represented the Andhra Pradesh Government. Addressing the august gathering Andhra Pradesh Chief Minister Mr N Chandrababu Naidu on Saturday said the state's new capital city Amaravati is a dream capital and will be an innovation hub. Assuring that Amaravati will be an altogether different city, the Chief Minister said it will comprise nine cities -- media city, sports city, government city, justice city, finance city, knowledge city, tourism city, electronics city and health city. He also shared with the audience that the media city will be the centre for cultural and heritage activities and developed with a long-term vision to host international events. Calling Amaravati a "dream capital", the Chief Minister said ultimately it will be the most liveable place, having electronic vehicles and self-sustained and green buildings with central cooling system. "Our hardships may have posed as obstacles but haven't allowed us to take our minds off our single-minded goal of developing our state. We have grown significantly at around 10-11% per annum with significant increase in per capita income," said he said. He also announced, "We are making Andhra Pradesh as an innovation valley", adding that he wants to promote innovations and for all the innovations, "Amaravati will be the centre, it will be the hub". Calling the Hon’ble Chief Minister a visionary Mr Vikas Sharma said Amravati will be India's first future city that will fuel the growth of the country, particularly southern parts of India. Amravati will compete with the world's top global cities. It will be a hub of all major activities in India he said. Mr Sandeep Marwah said that Mr Chandrababu Naidu is the only leader who can turn the dream of Amaravati into a reality. He said that we are looking forward to becoming a part of the Amaravati Media City. Ms. Archana Verma said that the Media city and the development of the entire state of Andhra Pradesh is in most experienced and capable hands of Mr Chandrababu Naidu. She requested the state government to look into investment incentives to lure Indian investors while at the same time focus on skilled manpower for the new city. Mr V Rama Manohara Rao informed the audience about the opportunities that lie in the Media City, while Mr. Metta Rama Rao gave them a glimpse of how despite the hurdles faced by Andhra Pradesh due to the 2014 bifurcation, the state is moving forward in a focused manner. The workshop was attended by more than 150 influencers from Delhi and NCR and was supported by Andhra Pradesh Capital Region Development Authority (APCRDA), Government of Andhra Pradesh. H2 Life Foundation was the official knowledge partner of the workshop.